The Magneet Festival is an inspired event running over the weekends between 23rd August and 15th September 2013. It has been running for a few years now, on a patch of land in Oost Amsterdam. The public decides on what will be happening and I am lucky enough to be invited to forage for the Mobiation Project, who are living in their incredible Mobi-01 home in the Green Zone. 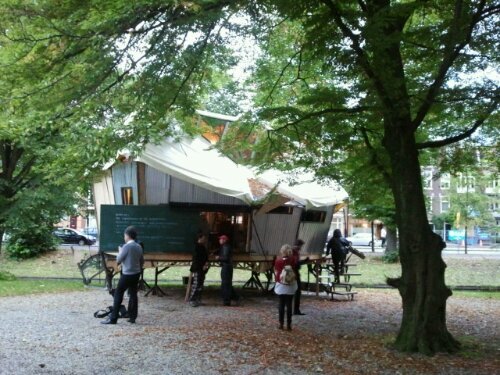 You may remember when they were living in Park Frankendael last year, at the Urban Outsiders exhibition. They will be offering all sorts of interesting activities to the festival participants and I’ll be helping them to eat from the land. One of the central features of the Magneet Festival is Leave No Trace! So I shall be showing participants how to forage useful plants from the site in an ethical way and teaching how to give something really useful back to foraging sites and the rest of the city. My foraging missions will be scheduled more tightly, closer to the event but for now I can tell you that I’ll be out there, whatever the weather, twice a day on the second, third and fourth weekends of the festival. There is no need to book with me but you will need a ticket for the festival and they are on sale now. Here’s a link to my event’s page in case you want to tell me that you will be there. It would be great to see you! It should be an awesome event so please participate and join the celebration.